KrystalCast® comes in three styles: Solid, on MDF, and on Baltic Birch. 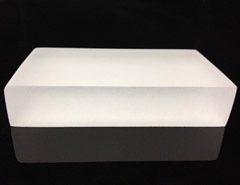 Tables, countertops, or paneling using solid KrystalCast may range in 1/4 – 2 inches. This also includes custom solid KrystalCast measuring up to 2 inches thick. Tables and countertops using KrystalCast on MDF will have a flat edge, 45° or 60° knife edge. 1/4″ KrystalCast is bonded to a balanced 1″ MDF. Tables and countertops using KrystalCast on MDF or Birch will have a flat edge, 45° or 60° knife edge.